Among the 2014-2018 centenary commemorations of battles, events and participants in World War I, the last major action of the New Zealand division – the relief of Le Quesnoy on November 4, 1918 – sounds a bright note. Because the division commanders decided not to bombard the whole town, only the ramparts, and finally take the place by stealth rather than frontal force, there were no civilian casualties among the population of around 4000. There were inevitably casualties among the New Zealand soldiers as they faced continual fire from German rifle and mortar fire and from machine gun nests hidden in hedges and on the ramparts themselves. The 2nd Battalion took in the northern outskirts and in the town close on 200 prisoners, two 77-mm. guns, three mortars, and 27 machine guns. Their losses were three officers and 19 men killed and four officers and 100 men wounded. The 4th Rifles lost two officers and a dozen men killed, and 40 men wounded. They captured two field guns, eight mortars and 18 machine guns. In all some 700 prisoners were taken in Le Quesnoy itself. There are 49 graves of New Zealand soldiers in Le Quesnoy Communal Cemetery Extension and 106 in the nearby Romeries Communal Cemetery Extension from these actions. The task given to the New Zealanders of taking the historic town in northern France, part of the Battle of Sambre, commenced by hard fighting to surround the town as nearby villages fell (Beaudignies was cleared by the 1st Canterbury Regiment on the 23rd October, 1918). 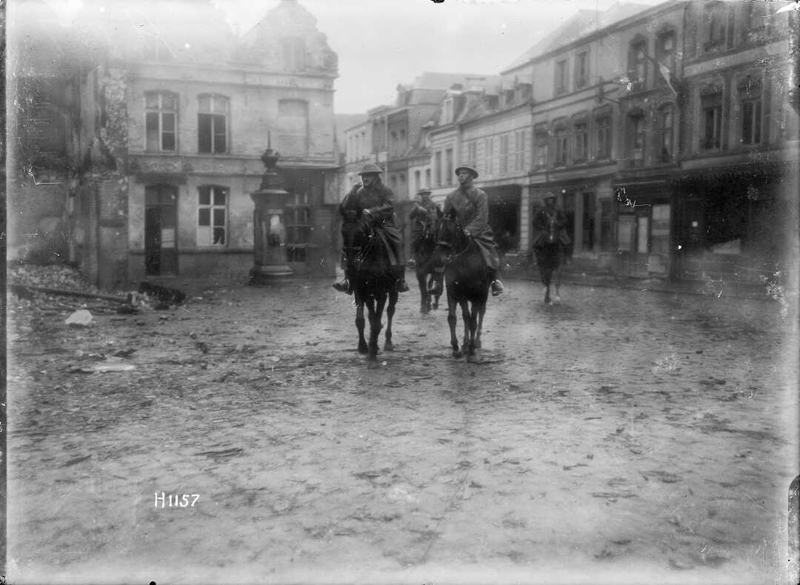 Le Quesnoy had been occupied by German troops since August 1914 and the dramatic success of the New Zealanders in dislodging the 1000-strong garrison is nowhere better highlighted than by Lieutenant-colonel Hugh Stewart in his popular history of World War I, based on official records. Stewart was present with the New Zealand Division as commander of the 2nd Battalion Canterbury regiment. He describes the two moats and individual defensive mounds that surrounded the town set high on ramparts that had been reinforced in the 17th century. New Zealanders attacking the Landrecies Gate and Valenciennes Gate into the town sent in German prisoners with messages to surrender without result. Messages in German were dropped from an aeroplane: “To the Commander of the Garrison of Le Quesnoy:—The position of Le Quesnoy is now completely surrounded. Our troops are far east of the town. You are therefore requested to surrender with your garrison The garrison will be treated as honourable prisoners of War. The Commander of the British Troops.” This had no effect. Early atempts to get close to the 18-metre tall solid brick ramparts, through the maze of 6-8 metre tall defensive demi-lunes or mounds and across the two-metre wide first moat, had met with resistance. One of his men in trying to get the Lewis gun into action against the machine gun was similarly shot through the head and killed instantly. The other three men were pinned to this very inadequate shelter in the heart of the fortifications for six hours with their dead companions. With the dispersal of the fog the German machine guns became at once more active, firing from all along the inner rampart. The Maoris of the Pioneer Battalion, set to work early on improving communications, had been subjected all the forenoon to bursts of long-range fire. Artillery officers anxious to move up guns and ammunition for battle in the area without the necessity of a long detour were continually, if not impatiently, seeking information as to the prospects of the town's early fall. Shortly after noon, therefore, Lieutenant-colonel Harold Barrowclough decided while avoiding unwarranted risks to make another attempt. The approach of the first party had been watched by a well-concealed German post which had returned to the top of the rampart. A shower of stick grenades fell about our party, causing no casualties but necessarily forcing them to drop the ladder and withdraw from their exposed position. A council of war was at once held. To attempt to cross the knife-edge 30-centimetre-wide stone bridge over the second moat, position themselves on a very narrow ledge three metes long at the bottom of the wall, rear a scaling ladder against the wall in face of hostile resistance and mount one man at a time was at best a most hazardous enterprise. It was obvious that the wall, an uncompromising cliff of red brick, was completely unclimbable except at this one spot. Barrowclough summoned Lt. Birch, the commander of the reserve company, to detail a platoon to make a fresh attempt. Three or four men only would mount at a time owing to the flimsiness of the ladder. Birch detailed No. 14 platoon under 2nd Lt. H. W. Kerr, who selected three of his best men to climb the ladder with him. 2nd Lieutenant Leslie Averill who had won the Military Cross in the siege of Bapaume three months earlier was to accompany the party. The rest of the battalion waited by the transverse wall. Everything that might help the scaling party in their desperate undertaking was done. A light trench mortar was brought well into the outlying ramparts, whence it poured in a brief sharp fusillade at the salients and the bombing post above the sluice-gate. The Lewis guns swept the whole of the parapet visible with heavy bursts of fire. Meanwhile Averill and Kerr were already working along the tree-covered bank to the edge of the inner moat. They picked up the ladder, and stepping on the knife-edge bridge in single file reached the sluice-gate. The whole place was ominously still but for the low gurgle of water in the moat below them. They hardly dared to hope that they would be left undisturbed by grenades. But no grenade fell from the empty silent rampart. Quietly they raised the ladder against the wall. It reached the top of the bricks with 30 cms to spare, resting against a grassy bank half a metre high, which crowned the rampart and prevented the projecting top of the ladder from being seen from the interior of the town. Two of the riflemen steadied the ladder on its insecure perch, and Averill started to mount it, telling the others that he would shout down to them from the top if all was quiet. It was now about 4 p.m. Averill quickly reached the top of the brick-work, and stepped over the coping on to the grassy bank. Crouching behind it, he peered over. It was one of the most dramatic moments in the Division's history. There was an instant crashing through some brushwood on the far side, and Averill saw two Germans of the bombing post running off panic-stricken. He sent a revolver bullet after them. Kerr was now on the topmost rung. The two officers could see a pair of machine guns on the salient on their right pointing into the moat but abandoned. They stood up and walked over the top of the grass slope and down the other side towards the boulevard. They were greeted by a great jabbering of German. Kerr fired a shot at the man who appeared to be leader, but missed. The whole enemy party bolted at once into an underground cavern under the rampart. By this time the remainder of the battalion were swarming up the ladder. They were led by Barrowclough himself, who took with him a signaller and signalling apparatus, in order to open communication with brigade headquarters from Le Quesnoy and establish the 4th Battalion's claim to the honour of the town's capture. The Germans recognising the fait accompli threw up the sponge, and some 15 minutes later the 2nd Rifles marched in through the Valenciennes Gate. As the different bodies of our men passed up the various deserted streets to round up their prisoners, a door would open cautiously, a head of some civilian, would peep out and immediately disappear again. In a few seconds the whole household would rush wildly into the streets, and in a few seconds more the whole street would be a tumultuous mass of indescribably excited townsfolk. The services of an English-speaking prisoner proved useful in extracting the numerous Germans who had sought refuge in the underground caverns below the wall and elsewhere. They were congregated in the Place d'Armes and sent back to the Divisional cage in batches of 50. Two or three houses had been set on fire by the enemy, and a large party of the prisoners was used to assist in extinguishing the flames. Others were employed in removing mines and booby-traps. In the process of mopping up the town, the riflemen were at once assisted by civilians, eagerly indicating the lurking places of their late masters. The New Zealanders were also not a little embarrassed by the warmth of the welcome extended by the populace to their liberators. To the description given in the 4th Battalion diary nothing need be added:—"The civilian population gave the troops a wildly enthusiastic greeting, thrusting flowers cakes and flags upon the men. Old men and women, and not a few of the Mademoiselles pressed forward eager to shake hands with or embrace the Diggers." Within an hour of its fall the 4th Battalion cookers came steaming into the town. At 11 a.m. the next morning an inevitable photograph was taken of the 4th Battalion formed up in the Square. “Preceded by the Mayor and Town Councillors and the band of the 2nd Battalion, the parade marched past the Brigadier and down a long lane of wildly applauding civilians across the ramparts and back to billets in Solesmes. There was not a vehicle in the transport but was flying the tricolour, and each platoon had its loads of flowers and flags and souvenirs from the delighted people." On the 10th, President Poincare paid an official visit, the New Zealanders forming a guard of honour on the Place d'Armes, and four days later General Hart and the Rifle Battalion commanders went back to Le Quesnoy from rest billets to receive a flag from the town and present in return a New Zealand flag. Shortly after the fall of Le Quesnoy the 2nd Brigade battalions marched up in the evening to Herbignies to obtain a short rest during the early part of the night before passing at dawn through the outposts of the 1st Brigade. Their advance was to be divided into bounds through the Mormal Forest, the first amounting to some two miles across a felled area mostly covered with dense fresh undergrowth. Here a road running north to Obies marked the western limits of the fighting. The New Zealanders would continue in action for another week until Armistice Day November 11. The continuing gratitude of the town and its citizens for the actions of the New Zealanders is shown in the Le Quesnoy street names with New Zealand connections, the memorial “in honour of the men of New Zealand through whose valour the town was restored to France” and the annual Anzac Day service held on the nearest Sunday to April 25.